Thank you for showing interest in the 33rd Regiment of Foot! 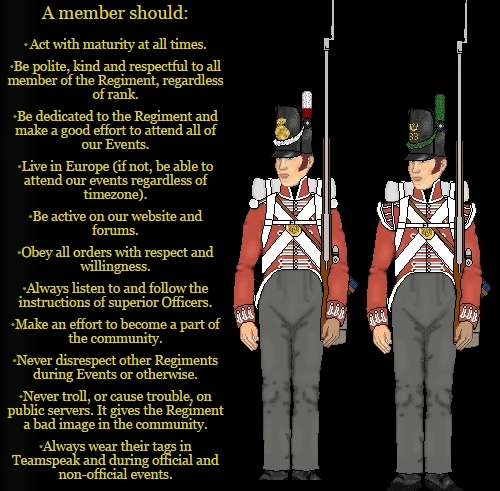 If you are in search of a mature, friendly and active Mount and Blade: Napoleonic Wars regiment based in Europe, then this is the regiment for you! We are a highly active regiment, comprising of various different companies. Our diverse list of events every week can be attended by all members no matter what your rank - whilst of course we recommend you attend as many events as possible, as a member your are only required to attend one event a week to maintain membership! What it takes to become a member. *IMPORTANT* Please provide a valid link to your steam profile via steam url, Go (Steam > Settings > Interface > Display Steam URL address bar when available) then go on your profile and copy the link. What is your steam display name? Name that we will call you by, make it unique, different, memorable, original. Is you desired In-game name and your website account name the same? Please make sure your ingame and enjin name are the same. For example if your desired ingame name is 33rd_Rct_Bob then your enjin name needs to be "Bob". This makes it easier to know who is who on the site. Go to account settings (on the top right corner) to edit your enjin name. Can you speak and understand English to about an intermediate degree? English is the main language spoken in the regiment, you need to speak and understand it well. No, but i will get it. Do you have push to talk set in teamspeak? Select choice Yes, I have push to talk set in teamspeak. No, I don't know what that is. Push to talk is a function in teamspeak, you press and hold a button to use your mic. It's required that you have it set. Be honest, don't worry if you're bad. You WILL improve when your with us. How long have you been playing this game and do you have any past NW regiment and/or gaming clan experience? Why do you want to join the 33rd? How did you find out about the 33rd? Who recruited you and what was their steam/ingame name? They will be rewarded for recruiting you. Please provide the name/link of the youtube video. Please state how you found out about the 33rd. Please select which events you are most likely to attend. As a member it is encouraged that you try your best to attend at least half of our own 33rd Hosted Events where possible. Our main 4 weekly events. What company would you like to join? Please note this is just to give us an idea of which company you want to join, the majority of new recruits are put straight into Center Company. If you are accepted you will need to apply on our forums to join one of the other two. I consider myself a steadfast line infantryman, I would like to join Center Company. I consider myself good at melee and active, I would like to join the Light Company. I consider myself a fine cavalryman, I would like to join the Cavalry Company. We currenty have 3 companies that you could join providing that there is space and you meet the requirements to join. Are you willing to follow the Code of Conduct for your time in the 33rd? Check this application regularly as we may require more information. Successful applicants will be contacted via a Steam friend request by our recruitment staff to take you through the application process, make sure to accept them and message them at the first opportunity. Understood, I will make sure to accept and message them when the request is sent to me. Make sure your friends list is not full. Unsuccessful applicants will be given the reason(s) for rejection under the "Applicant Discussion" comment section found below the application. To make sure you understand why we rejected you.